Full disclosure, I was provided a copy of this book by the author but have voluntarily chosen to write a review. All opinions are my own. 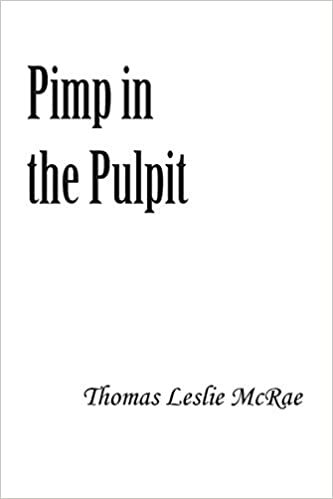 Warning – “Pimp in the Pulpit” is not for the easily offended, but if you’re looking for a gritty real-life look into the drama that plagues many a modern day dysfunctional family then this may be the read for you. Told mostly from the viewpoint of main character Edward Jones, Pimp in the Pulpit is less of an overall narrative than it is a series of small scenes into the life of a family that are probably at each other’s throats more than they’re not. The more I read the book, the more I imagined each chapter as another episode in what could easily be a sitcom along the same lines as “Married, With Children” or “Everybody Hates Chris. It seems that certain personalities exist no matter whatever the family structure, and McRae has illustrated this to the point that you may start to visualize a brother, cousin or distant uncle in the roles as you read. At the close of the book, it became clear to me that while this is a work of fiction, there may be a grain real life influence that has spurred the author to leave his dysfunctional family behind to become an author. While this is not what I would normally read, I did find myself laughing out loud at the antics of the family members. There is a humorous element to this tale, even if the overall theme is fairly bleak. If you have an hour or two to kill and you’re looking for a quick read, this may be a good book to try. Hello this is Thomas McRae author of Pimp in the pulpit. My sequel is done just waiting for publisher to send extra copies. But I love to mail you a copy since you gave me such a honest and we’ll written review. I love to hear from you and look forward to your response best wishes sincerely Thomas McRae. Hi Thomas, hope you had a peaceful and enjoyable New Year. I would love to read the sequel to Pimp in the Pulpit when available. Please note, I recently moved so please email me for my updated address once it’s available. Hope you and your family are well. Stay warm! Hey this is Thomas McRae your email Address I have isn’t sending my message did you change it. My email address is now mcraethomas135@gmail. com in case you have a different one. I got it. I just sent you an email.